All Alaska residents age 16 or older must possess a hunting license to hunt in Alaska and must carry it while hunting. Resident hunters 60 years old or older may obtain a free, permanent identification card issued by the Department. This card replaces the sport fishing, hunting, and trapping licenses. Disabled veterans qualified under AS 16.05.341 may receive a free hunting license. Residents with an annual family income below $8,200 (before taxes) may buy a low income license. Effective January 1, 2017, all Alaska Residents age 18 or older must possess a hunting license to hunt in Alaska and must carry it while hunting. Residents with an annual family income equal to or less than the most recent poverty guidelines for the state may buy a $5.00 low-income license. All nonresident hunters, regardless of age, must possess a small game or hunting license to hunt waterfowl. Members of the military service on active duty who are permanently stationed in the state, and their dependents who are living in the state, and are not yet Alaska residents under AS 16.05.940(24), may buy a special nonresident military small game license or a non-resident small game license. are hunting only cranes and snipe. If you purchase a hunting license and state duck stamp together online, your Alaska duck stamp number is printed on your license. No stamp will be mailed to you unless you contact ADF&G licensing. If you purchase a state duck stamp separately (from a vendor or online), the stamp must be signed across the face in ink and be in your possession while hunting migratory birds. CAUTION: Duck stamps (purchased separately from a license online) will be mailed to you and will take time to receive. If needed immediately, seek your nearest license vendor. 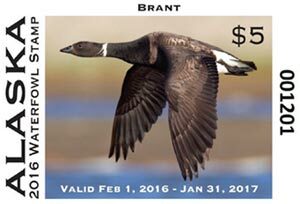 The 2016 state duck stamp features a photo of a Pacific Brant in flight by photographer Milo Burcham of Cordova, AK. Pacific Brant are small, dark geese with large wings, short necks, and a relatively small head and bill. While mostly black on the head, bill, breast, primaries, tail and legs they are distinguished by unique plumage markings on their neck where a series of white striations form a “necklace.” These markings make them easily distinguishable from other species of geese. In Alaska the Pacific Brant is found primarily on the Yukon-Kuskokwim Delta, Seward Peninsula and North Slope during breeding season. During fall migration the majority of the Pacific Brant population, including birds from Russia and Canada, stage in Izembek Lagoon near the tip of the Alaska Peninsula. This major staging area contains the largest eel grass beds in the world; the primary food source for Brant. In November, Pacific Brant migrate south along the Pacific coast, with most of the population wintering along the Baja Peninsula and west coast of mainland Mexico. Smaller groups of birds can be found along the coast of California, Oregon, Washington and British Columbia. About 30 percent of the population stays at Izembek Lagoon for the winter. Pacific Brant are managed for a population objective of 162,000 birds with a current Midwinter Survey average of 157,699 birds. This population has seen a slight increase in the past 5 years but overall has been relatively stable. The State Duck Stamp is valid from February 1 to January 31 the following year to encompass both the spring/summer subsistence and fall hunting seasons. 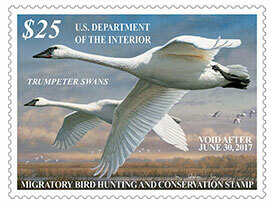 The 2016–2017 federal Migratory Bird Hunting Stamp features Trumpeter swans in flight. This stamp expires on June 30th, 2017 and can be purchased from the United States Postal Service and most major sporting goods stores and large chain stores that sell hunting and fishing licenses. All waterfowl hunters 16 years of age or older must have a current federal Migratory Bird Hunting Stamp. Federal stamps must be signed in ink and must be carried at all times while hunting migratory birds. Stamps do not have to be attached to a hunting license. A Federal Duck Stamp is not required if you are a qualified permanent rural Alaska resident or an eligible person living in an included area. Seasons when you may hunt without a federal duck stamp vary depending on how you qualify for this exemption. However, you must purchase a hunting license and state duck stamp unless you qualify for license and duck stamp exemptions listed above. For questions or clarifications, please contact the USFWS Office of Law Enforcement at (907) 786-3311. The Federal Junior Duck Stamp Conservation and Design Program is an integrated art and science curriculum developed to teach environmental science and habitat conservation. The program combines art, science, and cultural curricula to teach a greater awareness of our nation's natural and cultural resources. Participants select a species of North American waterfowl, do research on this species and its habitat, and then depict the waterfowl in an artistic medium. Students learn about conserving habitats while they explore the aesthetic qualities of wildlife and nature. It introduces school age children to an important and fragile part of the natural world. It instills a sense of individual responsibility toward the environment. It benefits waterfowl and their habitats as well as all migratory birds and hundreds of plants and animals that share wetland habitats. 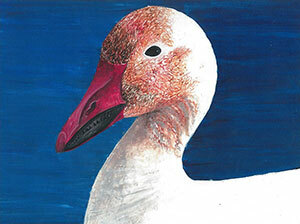 The Junior Duck Stamp is not required to hunt waterfowl. Proceeds from the sale of the $5 stamp are re-invested into the Junior Duck Stamp Program to support conservation education and provide recognition for contest participants and winners. The Program continues to educate youth about land stewardship and the importance of connecting to their natural worlds.